Located in the heart of the Financial District of New York City, Law Offices of Steven E. Lynch, provides tenacious legal representation for clients facing criminal charges and civil rights violations. Steven offers legal representation with a keen understanding of criminal defense and civil rights litigation strategy. 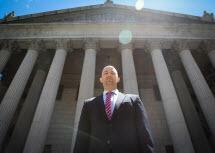 Steven E. Lynch has over a decade of experience defending the rights of New York residents. He is a proud advocate for clients during their time of crisis. Steven provides aggressive defense through years of litigation experience as an attorney. Your case will be carefully evaluated during an initial consultation. The law firm will form a defense strategy based upon your unique circumstances. Anyone facing the physical and psychological trauma of police officer misconduct should have a chance to defend their rights. Steven E. Lynch is an experienced lawyer in civil rights litigation. He will stand up against the injustice of excessive force, unlawful arrest and false imprisonment of his clients. Every case deserves dedicated attention to detail. Steven will sit down and discuss the reality of your civil right violation, and will explain the next steps. He will take the time to investigate the circumstances of the event and take a strong stance against any police misconduct. Steven is a proud advocate of your rights during this difficult time in your life.